Everyone loves a Biryani in India and thanks to Ammi's you can get them delivered quick to your door! But did you know that if you follow a few simple steps you can benefit from savings on every online food order? That's right, at DealSunny we have all the latest Ammis Biryani coupons and offers on one easy to access page, so you don't have to waste time Googling for deals that are actually valid. Simply click on an offer you want to use, and a new window will open explaining the terms and how to redeem it. Now you can buy freshly cooked biryanis without having to pay full price again! Browse our full list of offers below or use the search bar if you're looking for other stores, service providers or food delivery options. 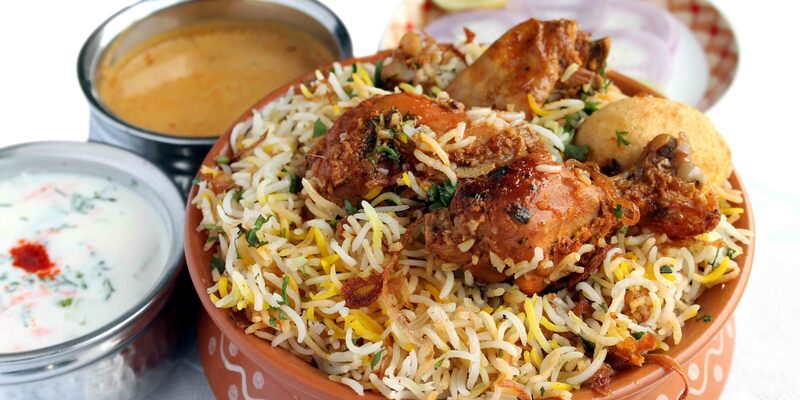 Ammis Biryani is an online cooked food delivery service and fast food chain that caters to customers in Bangalore, India, and other South Indian locations. The privately held company serves customers in person and takes home delivery orders online via the Ammis.in website and mobile apps for Android and iOS devices. As well as Biryanis they also sell a range of sides, beverages and sweets. On top of their efficient online platform and high quality food, one reason customers keep coming back is the range of special offers and deals available. Many of these are redeemed with Ammis Biryani coupons, a list of which we keep up to date right here at DealSunny. So don't forget to check back to this page before placing your order, to ensure you get the cheapest price possible! Ammis as a fast food chain has been around since 2008 and can be found all across the South, however the online ordering platform is relatively new. The company became Franchise India's Best QSR chain in South India in 2013 and 2014. They have chains in over 30 locations and hope to expand soon in to Chennai, Delhi and Mumbai. Today N. Sharief serves as chairman and managing director of the company, through the TMA Hospitality Services, parent company. "From authentic Kacchi Dum biryanis to regional favorites, unique kebabs to yummy rolls - we have a treat for every taste bud," notes the website. As the name suggests Ammis Biryani is best known for its biryani dishes, though they also serve kebabs, sides, other foods and drinks for a well rounded menu. All food is freshly cooked to order and comes from a standard menu that is updated from time to time. Customers can choose from single items, set meals and combos, with many opportunities to save money along the way if you know where to look. The Ammis Biryani promo code you choose from DealSunny will depend on the food you wish to order, how much you are willing to spend, and the type of deal you're looking for. Some coupons for example may be applicable for all orders, while others might offer deeper savings if you choose a specific combo or spend over a certain amount. Although the menu is subject to change current popular Biryani dishes include Veg, Chicken, Veg Hyderabadi, Chicken Hyderabadi, Thalassery, Spicy Andhra Style, and Mutton Hyderabadi. Popular sides include Achari Aloo, Chicken Kheema, Paneer Kalimirch, Chicken Sheekh Kebab, Chicken Tikka, and Guntur Chicken; as well as wraps such as Achari Aloo Roll, Paneer Kalimirch Roll, Chicken Kheema Roll, Chicken Tikka Roll, and Chicken Sheekh Roll. The two current desserts are Matka Phirni and Gulab Jamun with Cheesy Rabri. There are also beverages like Aam Sharbat, Sharbat-E-Nimbu, Coke, Sprite, and Bottled Water. Common packs/combos include 3 Murg Hyderabadi Biryanis and Coke, and 3 Hyderabadi Subzi Biryanis and Coke. All food is delivered in appropriate packaging to keep it warm and fresh and can be eaten straight out of the box. "Ammi's choicest biryanis, of which Kachchi Dum Biryani occupies a special place, are prepared and delivered to millions right through the year." Food Combos: If you purchase certain set combos of food from the menu, the overall price will be discounted or you can get a free drink. Simply add the required items or select the combo and the savings will be automatically applied. Ammis Biryani Coupons: These special codes can be applied on the app and website to redeem various discounts and deals. Only one can be used per order, but they can be combined with combos for even deeper savings. Regular Deals: From time to time select items on the menu will be discounted for a short period. You can also get money off for spending over a certain amount on your order. App Exclusives: From time to time users of the mobile app for Android or iOS are treated to exclusive offers, so if you have either type of device there's no excuse not to download the app. Here at DealSunny we maintain the most up to date list of Ammis Biryani offers on the web, but you might still find some exclusive by registering through the app or following them on social media accounts like Facebook, Twitter and Google Plus. The Ammis Biryani mobile app and website use secure payment gateways so you can pay easily online. They accept most commonly issued Indian credit, debit and cash cards (Visa, Visa Debit, Mastercard, Maestro, American Express, Diners Club), and you can also preload an online wallet with funds using the same payment sources. If you do not wish to pay online you can also select the Cash On Delivery (COD) option, which simply means paying the delivery boy with cash when your order arrives. They will then mark the transaction as complete. If you wish to redeem a Ammis Biryani coupon code while placing your order, make sure to enter it carefully in to the box prior to the payment step. If valid you will see a confirmation message and your bill will decrease according to the terms. Note, you can only use one code per order, but it can sometimes be combined with other non-coupon offers. Ammis Biryani aim to deliver your food order within 45 minutes. 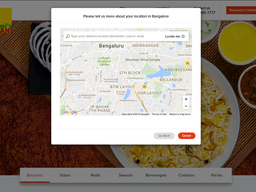 They serve addresses in Bangalore and are based at 3 Begur road cross. Delivery is completely free without have to use an Ammis Biryani promo code. Their box is designed to ensure that the biryani or other food arrives at your home retaining its freshness and flavour, as well as keeping warm and fresh. If an hour has passed and your order has yet to arrive, feel free to contact them via phone on 3945 7777. Traffic and other unforeseen circumstances can cause delays. If you are paying by cash on delivery, try to have as close to the amount in change as possible. Placing an order at Ammis Biryani couldn't be easier. All you have to do is open the app or go to the website and select your city and then the location from the map. The app is available for Android devices from the Google Play Store and iOS devices from the Apple App Store. You will then be presented with the menu. This includes detailed nutritional info and the price, and you can then easily add items to your cart. You can then go to checkout like a typical eCommerce site. Here you will also be able to apply any offer code for ammis biryani. Once your order is placed you will be given an estimated delivery time (usually within 45 minutes). After your first order you details will be saved for faster ordering in the future. If your internet is down or you don't have access to a device you can also make orders over the phone to your local chain. You can call Ammis Biryani to cancel your order and if it has yet to be dispatched, they will cancel it right away. You will then be issued an automatic refund if you paid using a card. If your order has already been dispatched it cannot be cancelled. Obviously if you have used any Ammis Biryani coupons to get a discount, you will only be refunded the actual amount charged after this was applied. Feel free to contact the chain if you are not satisfied with your order, such as poor quality, undercooked or other concerns. If items are missing the kitchen will work swiftly to get it dispatched to you. 50% OFF !!! Only for today on bills of Rs 500 & above.Call 39457777 (dial your local STD code). Applicable in Mumbai & Pune only.